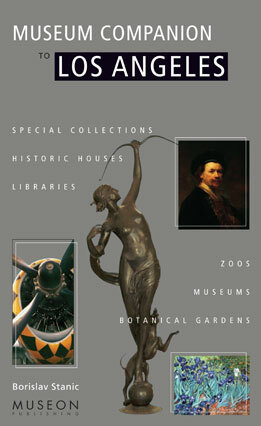 Museum Companion to Los Angeles is the only complete guide to Los Angeles museums, historic sites, libraries with special collections, botanical gardens and zoos. Museum Companion to Los Angeles is intended to guide the more than 15 million people who visit museums in Los Angeles every year. It is devoted to Angelenos and tourists alike — to anyone interested in exploring the vast cultural resources Los Angeles has to offer. This comprehensive, easy-to-use and intriguing guide to museums in Los Angeles is available to assist the city’s 11 million residents and 25 million annual visitors discover and explore nearly 300 museums, historic houses, libraries with special collections, botanical gardens and zoos in Los Angeles County. In addition to providing invaluable practical information for the visitor, the guide features lively descriptions of every Los Angeles museum and its collections, with interesting historical and architectural details, as well as each collection’s highlights. Museum Companion to Los Angeles‘s well-designed pages and clear, concise summaries of the special sites are intriguing, whether in search of traditional art museums, historical sites, whimsical collections of all kinds or movie memorabilia. All entries include the essential information of addresses, phone numbers, Web sites, hours, directions, admission prices and handicapped access. The book contains 800 photographs — many taken especially for this guide. Also featured are detailed maps and floor and garden plans enabling visitors to explore specific Los Angeles museums more easily. Well-researched and easy to use, Museum Companion to Los Angeles is your key to exploring Los Angeles’ world-famous as well as hidden treasures.